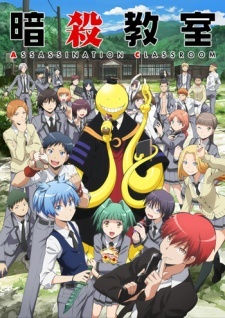 Two years before Assassination Classroom got a 22-episode anime series in 2015, it got this half-hour OVA from Brain's Base. It's doing the Kyoto school trip from episodes 7-8 of the series and chapters 15-19 of the manga. I didn't see much significant difference between the versions. Same jokes, story, dialogue and characters. The OVA's shorter at 30 minutes compared with 40 minutes in 2015 (excluding opening and closing titles), but I didn't notice the loss of anything important. I'll quickly recap the premise. A supersonic yellow octopus called Koro-sensei has promised to destroy the world next year, but in the meantime he's teaching Class 3-E at Kunugigaoka Junior High School. He's a fantastic (albeit very weird) teacher and his students love him, but every day they try to murder him. Apart from anything else, if they succeed, they'll get ten billion yen. Unfortunately it's not very easy to kill a crafty bugger who can regenerate all damage and fly at Mach 20, especially when he not only knows exactly what you're doing but is even offering helpful suggestions. This particular story's about a school trip. A gang of thugs and possibly wannabe-rapists are going to try to throw their weight around with our assassins-in-training (hint: not smart) and a professional hitman called Red Eye is about to discover that Koro-sensei regards snipers as potential playmates. Are there any differences between the two versions? Well, the art's a bit softer. Character designs are rounder and gentler. Everyone's still recognisably themselves, though. The two versions share no voice actors, but I only noticed the difference with one of them. All the humans sounded in line with my expectations, with the two Karmas in particular delivering their lines in exactly the same lazy, poisonous way. That's not a complaint. It's perfect for the character, who's particularly entertaining here, by the way. Tomokazu Seki as Koro-sensei, though, isn't as good as Jun Fukuyama in 2015. Seki's blander. He's having a reasonable amount of fun, but he sounds more like a normal person and he's not gloating, goofing off, patronising everyone and outright taking the piss like Fukuyama. Brain's Base don't even weave Red Eye's story into the earlier material to put everything in chronological order, which I'd been half-expecting. There's not much to talk about here, really. It's a laugh. It's Assassination Classroom. I enjoyed it and in any form it's an easy recommendation. However it's similar enough to episodes 7-8 of the 2015 series that I don't see much reason to hunt down one version if you've seen the other. Personally I'd go for the 2015 episodes for the extra length, but this would be a good introduction for someone who felt like checking out Assassination Classroom without diving into a 22-episode show. Give it a go!